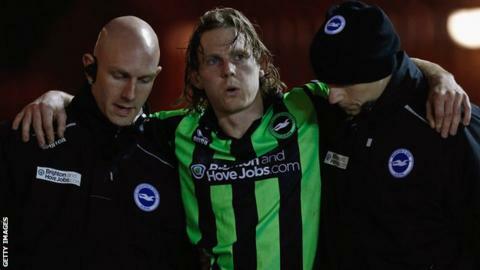 Brighton striker Craig Mackail-Smith is closing in on a first-team return after over a year out through injury. The 30-year-old ruptured his Achilles tendon last March and has subsequently had ankle and groin problems. However the Scotland international could be named on the bench at Barnsley on Saturday. Brighton head coach Oscar Garcia told BBC Sussex: "He is getting fitter and fitter and now he is available for selection." Craig Mackail-Smith joined Brighton & Hove Albion for a fee of around £2.5m from Peterborough in summer 2011. The former Peterborough striker has made two appearances for Brighton's development squad recently, scoring twice against Charlton at the Amex Stadium last Monday. With fellow frontman Will Hoskins also working his way back to fitness and Ashley Barnes sold to Burnley in January, the Seagulls have been reliant on the goals of Leonardo Ulloa in recent weeks. But Garcia has warned not to expect an instant impact from Mackail-Smith after his lengthy spell on the sidelines. "We can forget that he has not played for more than a year and we can put a lot of pressure on him," the Spaniard added. "He did well with the development squad. "It depends on the game but I know his abilities. He can help us a lot in the last period of the season for sure." Brighton centre-back Matthew Upson believes Mackail-Smith will add another dimension to their attack. "I think he has shown in the games he has played coming back to fitness that he is a very different option for us," Upson said. "Leo [Ulloa] has had a lot of weight on his shoulders and Craig will have an impact. "He brings something different to the group and at this stage of the season that is very valuable."